Some Poets need no introduction; One hopes. Lawrence Ferlinghetti is one of these masters. He is of the Beat Generation. NO. He IS the Beat. He was born in 1919 and is still an active Poet and activist. He founded City Lights Bookstore and publishing house; making is possible for Poets such as Allen Ginsburg to publish their work. I have made the pilgrimage to City Lights. You should too. Cathedrals come in many guises. “Poetry is a hard dollar,” my dad used to say. Poetry is a no dollar. Poetry is move, an action, a wrinkle in time with no way back. I go to sleep tonight grateful for Ferlinghetti and for all No Dollar Poets. I will take Time Warp Beat over Gold any day. Lawrence Ferlinghetti, “I Am Waiting” from A Coney Island of the Mind. Copyright © 1958 by Lawrence Ferlinghetti. Ferlinghetti’s A Coney Island of the Mind continues to be the most popular poetry book in the U.S. It has been translated into nine languages, and there are nearly 1,000,000 copies in print. The author of poetry, plays, fiction, art criticism, and essays, he has a dozen books currently in print in the U.S., and his work has been translated in many countries and in many languages. His most recent books are A Far Rockaway of the Heart (1997),How to Paint Sunlight (2001), and Americus Book I (2004) published by New Directions. ~ by Step On a Crack on April 18, 2012. Thank you for my breakfast-time reading this morning. I too am a breakfast reading Woman! I am happy this was in your morning. I am heading over to visit you on the Moors???? Wow. I dig. Thats alotta waiting my friend. I wait, but not holding my breath. Wonderful, thoughtful, SMART, right on! Thanks for sharing Jen! Very nice. 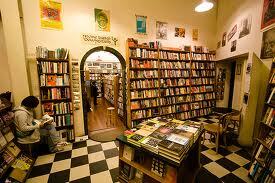 I love the picture of the bookstore too! Thank you! I LOVE City Lights. I love just being in the building and knowing how many Poets and Writers who have shaped our culture and who have taken risks have stood on that floor and read their words. Oh it makes me happy just to think of it! Love that poem!! I had never heard of him so thanks for the introduction!!! Hello there YOU! I am honored to have introduced you to one of the original Beats; if not THE original Beat Poets. I am glad you are back…. Wow, it has been decades since I’ve heard this poet’s name! Thanks for featuring him, and for your lovely exhortation that we must hold and keep our poets! Have an excellent weekend, Jen–God bless you. I hope you know that when I think of, write about Holding our Poets you are among those that must be held. I deeply respect your writing. Isn’t it weird who Words come and go? Do you think there is a rhyme or reason to the Muse? I am Happy this week is going better for you my Friend! breaks my heart. I am so sorry. Sorry is a weak and ineffectual word. My muse My son was born in 1998. The circle story continues. Betty. Sister of the Sea. THAT is beautiful. Oh Jen, I definitely love that your son was born in 1998, and is your muse–that does comfort me, that the circle continues. I am too happy to weep! An interesting juxtaposition to my blog’s poem today, also with a theme of waiting….